ZAB JUDAH: "SHANE MOSLEY SHOULD KNOCK PACQUIAO OUT"
"I've been watching the Pacquiao showdowns and, you know, I think a lot of them were staged. I think a lot of them were just different....I mean, fighters like Joshua Clottey, they just stood up there and didn't throw a punch. When I fought Joshua Clottey, he tried to go for broke. He tried to swing like he was swinging at an African lion. When he fought Pacquiao, he stood there like he was stuck on stupid, you know? Margarito is a fighter that we know to be a killer. He didn't do anything against Pacquiao, you know what I'm saying? I mean, I don't know. I can't say these guys are staging fights, but whatever the case may be, I think that an in-shape and well-trained Shane Mosley should knock Pacquiao out," stated two-division world champion Zab "Super" Judah as he shared his thoughts on the upcoming May 7th showdown between Manny Pacquiao and "Sugar" Shane Mosley. Check out what else he had to say about Floyd Mayweahter, his own upcoming March 5th title clash with Kaizer Mabuza, and much more. BT: A win on March 5th will definitely put you right back into the mix with guys like Khan, Bradley and Alexander. Yo, speaking of Alexander, did you see it's looking like his next fight will be with your last opponent, Lucas Matthysse? ZJ: Yeah, that's going to be a tough fight for him. Like I keep telling everybody, Lucas Matthysse was one of the hardest punchers that I ever fought in my life. I mean, I don't want to say nothing about anything, but he was super strong. He proved it in the fight with Chop Chop. I mean, Chop Chop's a guy who's not known to be knocked around like that and he went down 8 times in 8 rounds. That's kind of odd to see. Now Devon's going to take him on? 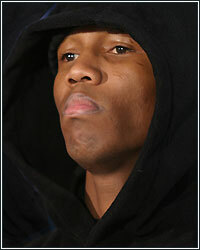 I mean, Devon's a good, quick fighter, but after the showing he put on with Bradley, I don't know. One thing Matthysse is going to do, he's a hard puncher and he's going to bring it. Hopefully we'll see something big come out of it. Keep watching Matthysse, you'll see. After a couple of fights, then people will start saying, "Okay, we gotta give Zab his credit because Zab did beat him." Matthysse is a tough fighter, you know. Eventually, these guys will start seeing that Zab is a problem in the boxing world whatever weight class he should pop up at and when he's focused, he's a vicious person. BT: What's up with your boy Floyd? I talked to him a little while ago. You hear from him lately? ZJ: Yeah, as a matter of fact, I talked to Floyd yesterday. Yesterday we chopped it up. He told me he's coming to the fight and said good luck and wished me well. That was nice. BT: Cool, cool. What do you think about Manny Pacquiao's upcoming fight with Shane Mosley? I know at one point, you were hoping to maybe get a crack at him. ZJ: I mean, that's good. Like I said, man, I've been watching the Pacquiao showdowns and, you know, I think a lot of them were staged. I think a lot of them were just different....I mean, fighters like Joshua Clottey, they just stood up there and didn't throw a punch. When I fought Joshua Clottey, he tried to go for broke. He tried to swing like he was swinging at an African lion. When he fought Pacquiao, he stood there like he was stuck on stupid, you know? Margarito is a fighter that we know to be a killer. He didn't do anything against Pacquiao, you know what I'm saying? I mean, I don't know. I can't say these guys are staging fights, but whatever the case may be, I think that an in-shape and well-trained Shane Mosley should knock Pacquiao out. BT: Woooooo. So you think Shane has a shot to pull off the upset? ZJ: I mean, I don't know. Like I said, anything is possible. I mean, if he prepares himself well, he should. He has enough experience. He's the bigger guy. I mean, he knocked out bigger men. He knocked out Margarito. He knocked out a lot of guys, you know? Big, big, solid fighters, you know what I mean? Mayorga. Shane is known for having powerful shots and a little guy like Pacquiao, I don't see why Shane shouldn't be able to walk through him and knock him out. But that's at 47 and I campaign at 140, so, you know, unless those guys plan on coming down, I don't see nothing going on with us, so I can't elaborate on what's going on with those guys. BT: You were supposed to fight Shane at one point. ZJ: Yeah, yeah. Me and Shane were set. We had a press conference and everything and then, you know, I slipped and fell through a glass door and I received like 60-something stitches in my arm. I was out for a little while, but, you know, I got it together and I'm back. What else can I say. I'm back, I'm back, I'm back. I'm back in a weight class that I'm comfortable at. I'm back in a position that I wanted to be in and in 14 days, I'll be the new IBF jr. welterweight champion of the world. BT: You know, it's seems like just yesterday, but it's been nearly 5 years since I saw a ripped up, focused and fierce Zab Judah step in the ring and give Floyd Mayweather the toughest fight he's had to date. ZJ: Oh yeah. Like I said, it was a very competitive fight; a very competitive fight. I just had the wrong game plan. I had the right game plan, but the wrong game plan. I went in there, you know, I guess because of the build-up with Floyd's mouth and everything, I kind of thought when we meet, we would meet in the middle of the ring when the bell rings and we would go for broke. That was my intentions, but Floyd had another plan. He boxed and, you know, I hit him with some big shots that really hurt him and he withstood the punishment and he went on to win a 12-round decision. Even with the controversy, I mean, we all know that when two fighters are in the ring, if any other person steps in the ring other than the referee, the fighter is automatically disqualified. So, I mean, there's some things to that that could have gone another way, but hey, it went the way it went, it was God's plan and God worked it out the way He wanted to work it. I mean, to this day, me and Floyd is cool. We're cool, we have a cool relationship and we just keep it like that and everything is okay. BT: True, true. You know though, here we are, 5 years later, and you're in a position where another impressive win or two could potentially put you in line for a rematch with Floyd. ZJ: I mean, yeah and no. Like I said, Floyd fights at 147. Unless he's able to lose some weight and we're able to meet in the middle somewhere, I don't know. We had a conversation one day and he told me, "Zab, I'm finished. I'm done. I'ma just chill. I'ma chill out and just kick back." I wish him well though, you know what I'm saying? But like I said, I'm going to take advantage of the opportunity. He was pound-for-pound the king of the boxing world and if he did step down and dethrone himself and the crown is laying around, I'll pick it up baby and put it on my head and wear it proudly. 14 days, get the crown ready. Dust it off. I'm back! BT: Well let me let you get out of here Champ. Is there anything else you want to say in closing? ZJ: Like I said, in 14 days, I'm going to show them why I can talk the way I talk. Number one, all praises to Jesus Christ. He delivered me and took me from a world that I was having trials and tribulations in and he delivered me from it. Like I said, all praises and respect due to Him and with that being said, with God on my side, I cannot lose.